Stop making cartograms! At least until permission is granted from the chap who holds the patent on them. Curiously, it’s claimed that Karsten also invented the hedge fund. The idea is good, but in practice it’s a bit wonky. 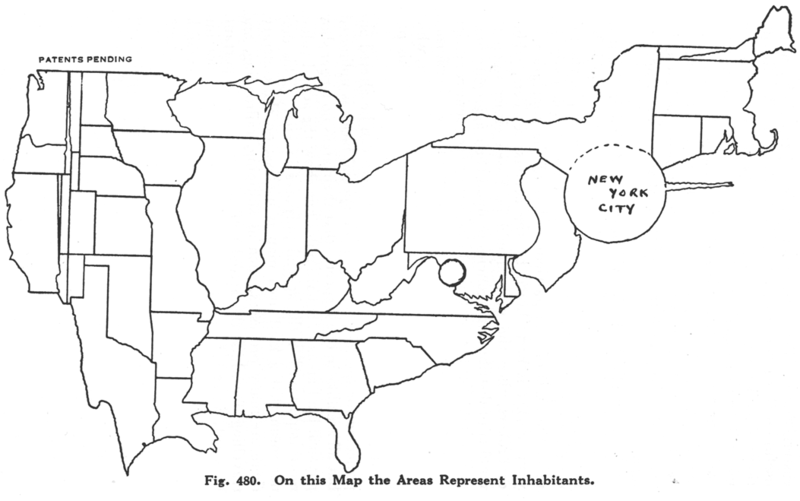 Several western US states are reduced to toothpick dimensions, and note the New York goiter (New York City). Also, Karsten seems to have some degree of difficulty maintaining the horizontal with the map and the legend. Could he have had an inner-ear infection? Details of the methodology can be found in the text of the patent. We do not sell our goods to the mountains, bill them to the rivers, or credit the forests with payment. Probably from at least a subconscious appreciation of this circumstance, many national distributors, advertisers, and sales-managers have discarded maps on which the rivers, forests or mountains are shown when they are studying the geographic distribution of their sales. The up-to-date sales manager lots his distributing points and records his sales in a great many ways upon maps which carry only faint State outlines or a the most show the location of larger cities. But why stop here? Your sales manager does not sell to square miles, acres, or other units of land-area measurement. He sells to human beings. Why should he use maps which show, not human beings, but square miles, that is, maps in which the areas indicate not the population but the land surface? Why indeed! The result of this projection of the map of the United Statues upon a population basis rather than a land-area basis will be most surprising even to the most hardened travelers. Needless to say, the picture of sales conditions which such a map exhibits, will be far more valuable and useful than the picture upon the usual land-area basis. 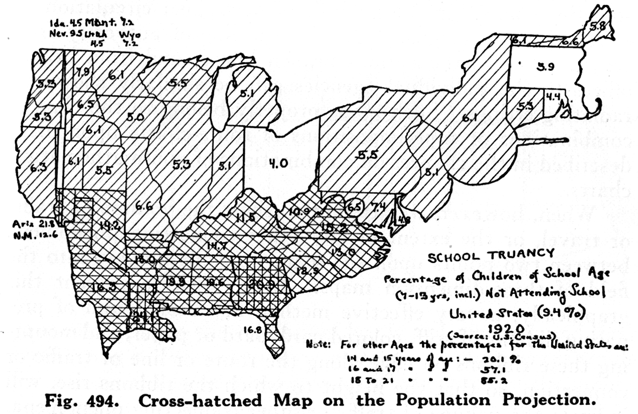 In short, the corrected areas of the States serve to give an excellent background or evaluation of the importance of the statistics plotted upon the map. The number of ways in which the map can be altered and projected for special purposes upon special bases is unlimited, but all are alike in one respect – that their areas no longer show physical land areas in square miles but show the actual values more important for the special purposes in view. 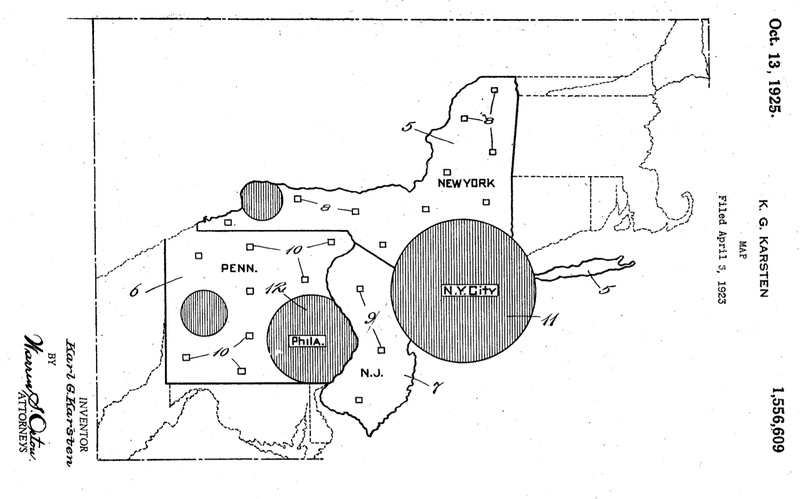 In 2005 a series of cartogram patents (here here here) failed to cite Karsten’s patent. Didn’t the patent run out in 1940? Yes. My command to stop making cartograms was intended to be slightly humorous.